Summer in the early 20th century brought an outsized concentration of Russian intelligentsia, bohemians, artists and writers. Simply meandering around local beaches would have been a good way of spotting members of the country’s intellectul elite. The first time that Anton Chekhov felt ill was in district court where he worked as a reporter for the “Peterburgskaya Gazeta” newspaper. Chekhov had all of the symptoms of pulmonary tuberculosis: he had blood in his sputum, a fever and felt weak. However, for some reason he did not attempt to receive any treatment, even though he was not only a writer, but above all, a doctor. 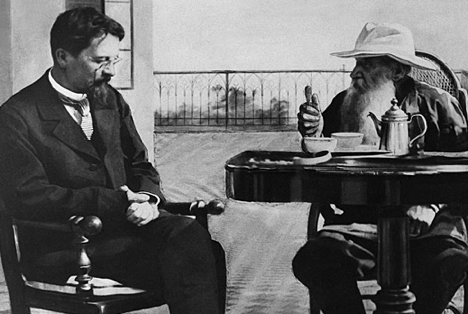 Chekhov had to move to Crimea after his health worsened dramatically. He sold the rights for all of his prose works and with these proceeds built a small villa not far from Yalta (1276 kilometers from Moscow). He planted saplings and flowers around his house and decorated everything according to his taste – modest, yet classy. They say that the writer’s wife Olga Knipper-Chekhova, a famous 20th century stage actress, had a passion for wild parties. However, Chekhov was able to tune out the noise during parties and write his brilliant works in the corner of a crowded living room. However, Chekhov’s wife did not visit him very often. He knew how important the job at the Moscow Art Theater run by Konstantin Stanislavsky and Vladimir Nemirovich-Danchenko was for her and he insisted that she stay in Moscow and keep her job. Owing to the efforts of the writer’s sister Maria, the interiors of Chekhov’s dacha have kept their original form. In the library where Chekhov wrote “Three Sisters” and “The Cherry Orchard,” plays that are still staged worldwide, it is possible to see the ornate conditions in which he worked. The library contains an antique telephone set, his writing desk and photographs of Leo Tolstoy and other contemporaries of the famous writer. I took a walk through the garden, embraced the big old trees that were planted by this extraordinary man and tears began to flow from my eyes – so emotional was the moment. Up to 600 top creative intellectuals came to symbolist poet Maximilian Voloshin’s dacha in Koktebel (1433 kilometers from Moscow) every summer season. Although he was not a rich man, Voloshin hosted all of them for free. Voloshin’s mother Elena managed housekeeping entirely by herself so that writers and painters could concentrate on their art and not be distracted by anything else. Here the young poet Marina Tsvetaeva, whose father founded the Pushkin State Museum of Fine Arts in Moscow, met her future husband Sergei Efron. Mikhail Bulgakov, whose “A Young Doctor's Notebook” was recently adapted as a miniseries starring Daniel Radcliffe and Jon Hamm, first read his unpublished works at this dacha. In Voloshin’s studio hang portraits of him painted by Diego Rivera, whom he met in Paris. In bohemian circles Maximilian Voloshin was famous for his singularity: he loved to dress up in ethnic costumes and invent funny rituals for various occasions. One charismatic tour guide from the Voloshin Museum told me that she, too, likes to wear ethnic costumes, as do many of the local residents in Koktebel. The world famous Russian writer Leo Tolstoy participated in the battles of the Crimean War between 1853-1856. This was the largest of all 19th century European military campaigns with France, Great Britain, the Ottoman Empire and Sardinia all fighting in opposition against the Russian Empire. Tolstoy described the Siege of Sevastopol in 1854-55 in his “Sevastopol Sketches” after witnessing the events himself. The Siege of Sevastopol panorama, a large-scale work of art that depicts those dramatic events can be found in the Defense of Sevastopol Museum. With time this painting has become one of the city’s most-visited and spectacular attractions. This huge canvas is 115 x 14 meters and shows the heavy fighting of these events that made the idyllic seascapes of Sevastopol unrecognizable. The panorama is enhanced by a 1000 square meter recreation of the 19th-century military fortifications used in this battle. Currently, this is one of the 60 largest panoramas in the world. Everything that Leo Tolstoy wrote about 150 years ago is somehow magically still in the air of Sevastopol. This is a city with a heroic atmosphere. The only tour company for foreign visitors operating in Crimea at the moment is Southern Comfort. The company employs tour guides that speak English, French, German, Italian, Spanish, Chinese, Japanese as well as other languages, and managers that can organize gastronomic, environmental and wine tours. They can also develop tailor-made routes based on a client’s wishes. The easiest way to reach the peninsula is by plane. Russian airlines Aeroflot, Transaero, S7, Donavia and Utair, and the charter airline Vimavia fly there from all three Moscow airports. The planes are often full, therefore it’s best to book your flight in advance, especially if you want a window seat or to sit together with your companion. The flight takes 2.5 hours. Roundtrip fares from Moscow start at 5,500 rubles (about $110). The cheapest plane tickets to Crimea can be found on jetradar.com. RIR Editors’ note: A little more than a year has passed since a referendum was held on Crimea, which led to a treaty being signed between the peninsula and Russia. This has been the source of enormous controversy between Russia, Ukraine and the West and many foreign embassies warn citizens against travel to the peninsula. As a result of economic sanctions that were passed in response to this event, traveling is not easy in Crimea: practically no international airlines land here and visitors must bring fistfuls of cash with them. Bankcards and credit cards are not accepted anywhere, although it is possible to change foreign currency in banks.